Here is a review of a pair of classes I taught in Waverly, TN. Chief Weems, with his Benelli M1 Super 90. Federal Flite Control was emphasized for it’s ability to keep the pattern on an IDPA target (in the, “down zero,” ring) which means that with practical application of accuracy, keeps the shooter accountable for all 8 or 9 (both quantities of buckshot are available in the Flite Control configuration) pellets, and (wait for it…) complies with the Chief’s dictum of full compliance with the 4 FIREARMS LIFESTYLE RULES! Don’t throw those cardboard IDPA or IPSC targets away. You can easily extend their useful life. All you need is some quality spray adhesive and some paper targets as shown below. On the left is the San Jose Repair Center from Action Target. The cost is $0.21 each plus shipping if you order at least 100 of them. I’ve started using these in my classes. I like the scoring areas for several of my drills and courses of fire, and a new repair center can be put up quickly. This also saves a lot space in my truck. On the right is a paper “Langdon Cut” IDPA target from National Target. An order of 100 is $37.00. You have to specify the “Langdon Cut” when ordering. Claude Werner of The Tactical Professor brought these repair centers from the TargetBarn.com to my attention; so, I am updating this article to include them as an option. That fine gentleman of the range, The Magnificent Steve, came up with a nifty target stand design. He was kind enough to make some for me that will work for both 18″ and 24″ width targets. I first became aware of The Complete Combatant due to their hosting Caleb Causey of Lone Star Medics for one of his medical courses. Caleb is a a regular presenter at the Rangemaster Tactical Conference, and that is how I met him. I attended the course, that is how I met Brian and Shelley Hill, the owners of The Complete Combatant. This introduction resulted in Brian and Shelley hosting two of my Police-Citizen Contacts courses. They have another class with Caleb coming in September; so, be sure to check their schedule IF you aren’t planning to spend that weekend with me at Social Levergun. Quality medical training should be a part of your personal safety plan, and Caleb has a solid program. 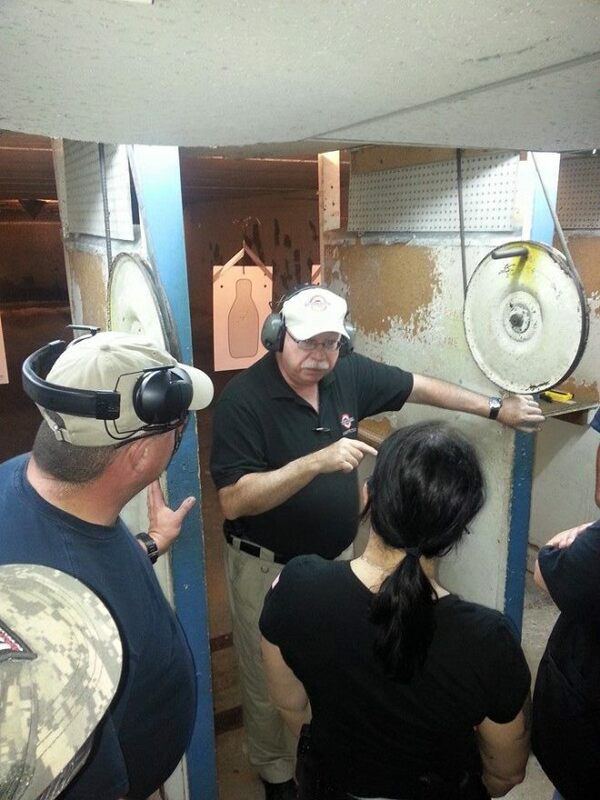 I will be teaching a pistol clinic at the Red Hill Range in Martin, GA, (Franklin County) on October 24th. The clinic will culminate in the shooting of the FBI and GA POST qualification courses. Students who pass the courses will receive a letter of documentation to that effect. I am a certified FBI Police Firearms Instructor as well as a GA POST certified Firearms Instructor. The qualification courses are roughly the skill level of what a decent MM level shooter should be able to do. While certainly not a legal requirement, for a person who carries a firearm, having documentation that you have passed both a state and federal level qualification course could prove beneficial. For more details and to register for the class, click here. Broward County (FL) is home to one of the most modern indoor shooting facilities in existence. Unfortunately, it wasn’t available, and our class was held at an indoor range built in the 1940s. It made for a very interesting shooting experience. The class consisted of 12 students; all graduates of the Rangemaster Instructor Development Course (IDC).